We spent Christmas morning and early afternoon at our house, then journeyed up to Vermont, where many members of my family and snow awaited us for merry-making. Christmas dinner is traditional with my family, with potato leek soup to start, steak with a sauce that takes 2 days to prepare, and my beloved broccoli-stuffed tomatoes. I just went to add the link, and I realized that I’ve never posted that recipe, which is crazy. They’re so good. So we’ve been with the family for about 24 hours, and it appears that many of them have appointed themselves to the Capital District Fun Editorial Board. 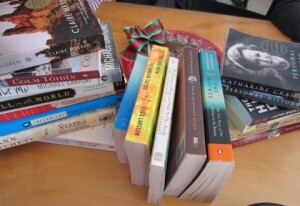 On several occasions I’ve had suggestions about exactly what should be featured on the blog. At one point my sister came into the house with instructions to get outside and take a photo for the blog. Then, when I went outside, I met a passerby who knew that I’m “the one who blogs.” In Vermont. What? Oh, of course: she’s friends with my mother. Without further ado, here are just a few items that I should cover according to my new Editorial Board. 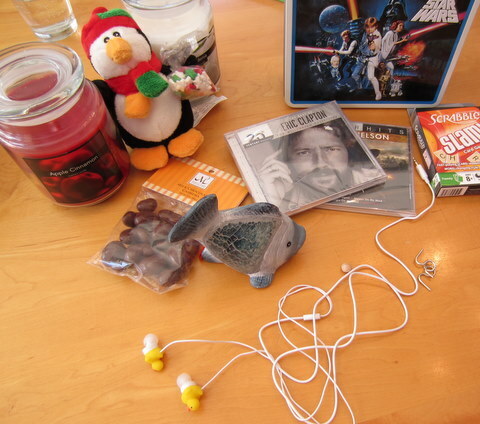 Candles, M’s gift that she contributed (penguin, chocolate-covered nuts, and a fish), rubber ducky headphones, an Eric Clapton CD, a Star Wars lunch box, and a Scrabble game. My sister B (who comments as Big Sister) has instituted a grading system, now, so the inside cover of the books has the owner’s name (if she wants it back eventually) as well as a letter grade and any additional comments. That’s M wearing trash bags on her legs. 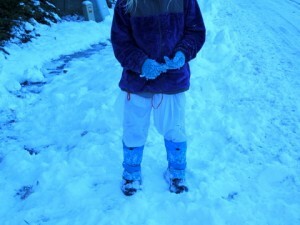 Yesterday we couldn’t find her snow pants, and I finally brought along an outgrown pair–nope, didn’t work. So she came up with this idea herself (while I was away taking a walk): she put a bag on each leg, then used Christmas ribbon to tie them on. Meanwhile I did have her bring along her winter coat and waterproof mittens, but since she received a North Face fleece and cloth, non-waterproof gloves for Christmas, she decided to complete her Completely Inadequate For the Conditions outfit with those instead. That’s what’s happening with us. Cute W, M, and cousins are playing Small World and I might try a quick nap before I report to the late-afternoon cheese spread. Love the snow pants. Reminds me of a photo (and endless laughs each time we dig it out) from when I was about 5 or 6 and wearing plastic shopping bags over each of my feet and another pair as pants (with the bags’s handles as suspenders!) because I was visiting my (favorite!) aunt and didn’t have any snow stuff with me.